Houghton Mifflin Harcourt, 9780544381001, 272pp. Marriage equality has surged across the country. Closet doors have burst open in business, entertainment, and even major league sports. But as longtime advocate Michelangelo Signorile argues in his most provocative book yet, the excitement of such breathless change makes this moment more dangerous than ever. Puncturing the illusion that victory is now inevitable, Signorile marshals stinging evidence that an age-old hatred, homophobia, is still a basic fact of American life. He exposes the bigotry of the brewing religious conservative backlash against LGBT rights and challenges the complacency and hypocrisy of supposed allies in Washington, the media, and Hollywood. Not just a wake-up call, It's Not Over is also a battle plan for the fights to come in the march toward equality. Signorile tells the stories of lesbian, gay, bisexual, and transgender Americans who have refused to be merely tolerated, or worse, and are demanding full acceptance. And he documents signs of hope in schools and communities finding new ways to combat ignorance, bullying, and fear. 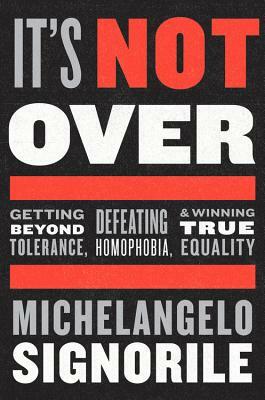 Urgent and empowering, It's Not Over is a necessary book from one of our most electrifying voices. MICHELANGELO SIGNORILE is the best-selling author of Queer in America. He is the host of the Sirius XM radio show The Michelangelo Signorile Show and an editor-at-large of Huffington Post Gay Voices. An award-winning journalist, Signorile has written for dozens of magazines and newspapers, including the New York Times, Los Angeles Times, USA Today, New York Magazine, Salon, and the Village Voice.